The concept is this: if a team needs more than one pizza to feed it, it’s probably too large to be effective at making major decisions. 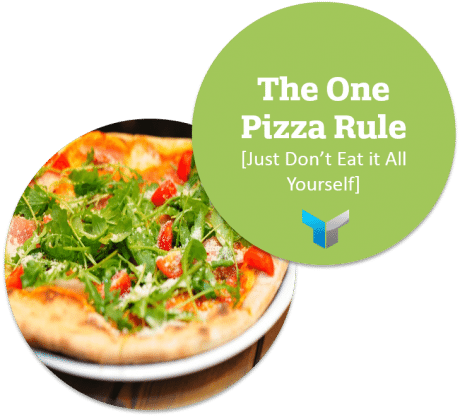 There are some variations on this — Jeff Bezos from Amazon is apparently a little more generous with portions and has a TWO pizza rule – but the basic idea stands. We run into “excessive pizza” challenges all the time. With a new website marketing campaign, or sales initiative, there are many stakeholders that a project will touch. Certainly the marketing and sales teams, IT, senior leadership, and finance will be impacted… but if you get ALL of these folks in a room together to decide on the exact shade of blue you’d like your call-to-action buttons to be, you’re going to see rapidly elongating timelines and scope creep galore. Successful marketing breakthroughs are rarely engineered by massive committees. Often the compromises agreed upon by a large group result in a watered down final product. 3-5 people is the ideal sized group we typically recommend including in meetings and final decision making regarding a new marketing project. If the team starts getting much larger than that, start thinking about splitting into subgroups where different people tackle different parts of the project. If it’s necessary to include more people in the process, you may also want to consider using online collaboration tools like Basecamp, Chatter, or something similar to gather input – because when you start thinking about the salary and opportunity cost to an organization when everyone and their mother is included in a meeting, it’s pretty staggering. Over to you – what size and mix of people have you found encourage the most successful group dynamics? What tools help facilitate effective collaboration and consensus building? How do you balance the need for inclusion with driving decisive action?